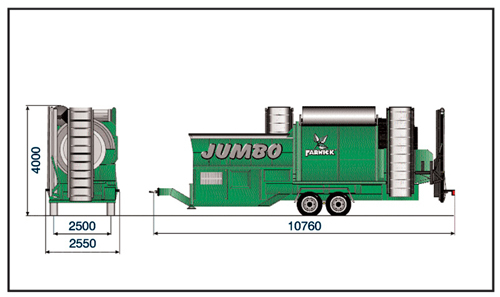 The JUMBO was designed especially for users who want to separate up to four different fractions in one screening pass, such as when processing gravel or construction debris, recycling wood, etc. Only mobile trommel screen machine with two trommel screens, which rotate in opposite directions, for screening of 3 fractions - allows for throughput of up to 160 m³/h. Large load capacity due to robust design, heavy conveyor belt as well as hopper overload protection and motor protection system - for screening of rubble and similarly heavy materials. Intelligent concept: trommel screen running on the outside for loosening and coarse material separation (80 mm) with discharge to the rear, trommel running on the inside for fine and medium fraction with belt discharge to left and right-hand side. Flexible operation, since the outside trommel screen is equipped with screen segments (patented) which can be rapidly replaced (hole sizes from 8 to 60 mm). High operating convenience due to continuous rotary speed control of the trommel and the hopper belt with hydraulic straight-discharge control as well as hydraulically foldable and extendable discharge belts. Optimum maintenance due to easy access to all units and simple trommel replacement system.